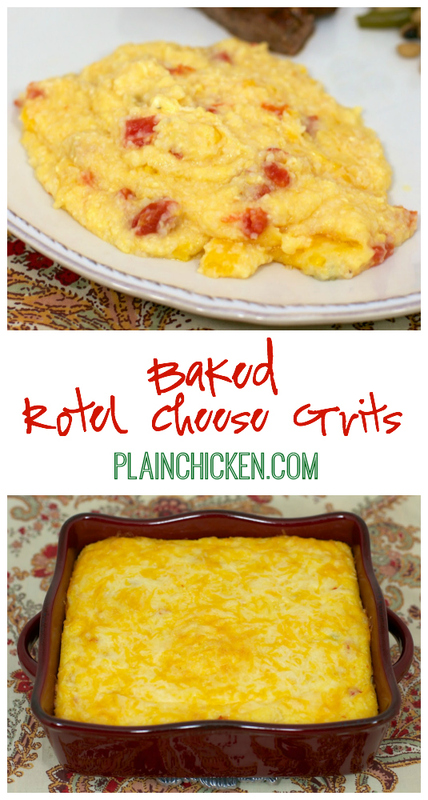 Baked Rotel Cheese Grits - quick side dish recipe - grits, cheese, butter, eggs and rotel - these grits are to-die-for! If you've never tried grits, this is the recipe to make you fall in love with them! 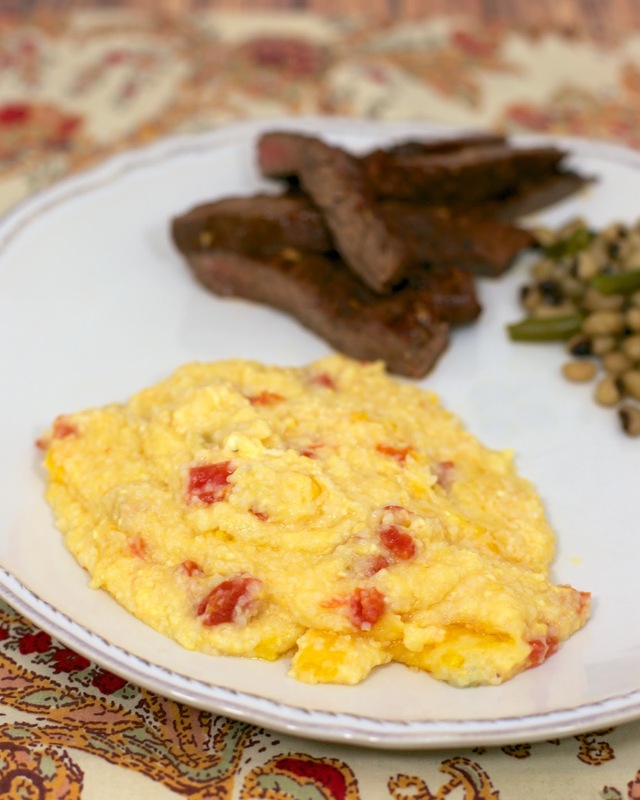 We ate these baked grits with the Sweet Heat Skirt Steak from yesterday's post. They are crazy good! A friend told me about a recipe she tried for Rotel Cheese Grits. She raved about them and said she would email me the recipe. Well, she never did. I really wanted to try the grits, so I made my own recipe. I decided to adapt my favorite baked cheese grits recipe by adding some Rotel tomatoes. We both really loved them. They tasted fantastic! They are even good reheated the next day for lunch. Bring chicken broth and salt to boil in medium saucepan on medium-high heat. Add grits, stirring constantly until blended. Cook on low heat 5 minutes, stirring occasionally. Remove from heat. Stir in 1/2 cup cheddar cheese, Velveeta, butter, garlic powder and Rotel; stir until cheeses are melted. Set aside. Beat eggs lightly in small bowl. Add small amount of hot grits mixture to eggs; mix well. Gradually add egg mixture to remaining hot grits mixture, stirring constantly until blended. 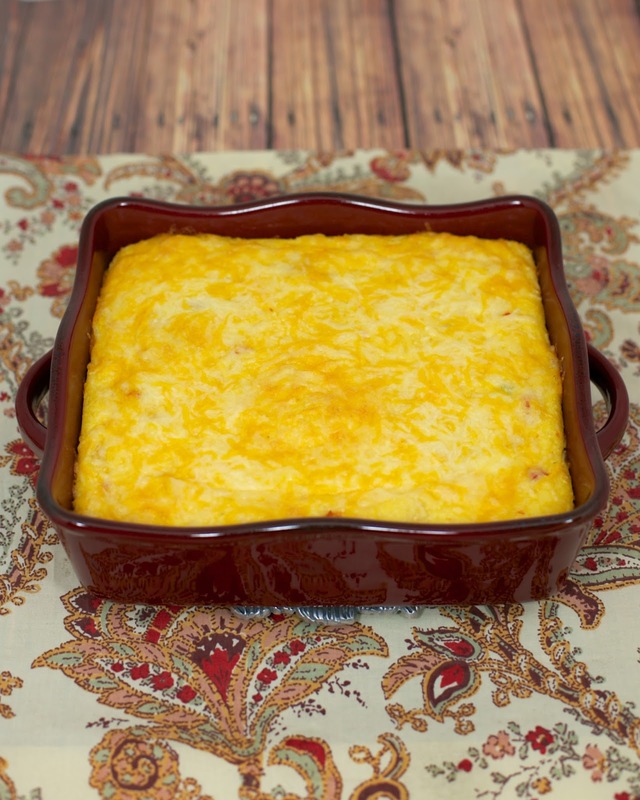 Pour grits into greased 8-inch square baking dish. Bake 30 minutes; sprinkle with remaining cheddar cheese. Bake and additional 10 minutes. Let stand 10 minutes before serving. I remember where we were when we begged you to experiment with this idea...love! This is going on the list for the next Sunday Steak Night! I haven't been this excited to make a recipe in a long time! I made these Saturday night for a cookout we went to. AMAZING!!! We ate every bite and I think someone may have licked the pan!